Ozoneering’s most recent success was putting the team together for the technical development, route to market and sale of the Ascenta™ solar powered HALE platform to Facebook in March 2014. The origins of Ozoneering go back 25 years. It begins with an audacious proposal to fly two open wicker basket hot air balloons over the summit of Mt Everest, 29,028ft. One of the objectives of the adventure was to make a TV documentary. Simple to say, but how to deliver from a non-human environment, with static temperatures of -30 Degrees in the jet stream at 33,000ft. To satisfy the environmental, technical requirement, ergonomic and human factors we designed and built a unique protective camera platform from leading edge materials and fabrics of that era. This operated perfectly on every level .The cameraman’s balloon crashed in Tibet, and with camera platform still attached, was dragged for over a mile through glacial moraine and vast boulders, but the platform surpassed its specification and none of the film was lost or cameras damaged. The documentary won several international awards. 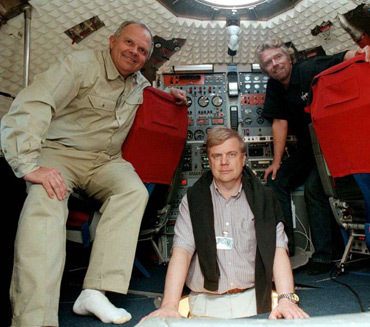 Our services were called upon again to address living space needs in the Virgin Global Challenger Capsule participating in a competition to fly around the world. The capsule was already being fitted with its avionics when we were asked to become involved. It was built with internal solid wall crossed bulkheads to give it strength, leaving 3 internal compartments that did not connect or relate to each other. Further, it was to take 3 crew with duration of 20 days, flying pressurised at 30,000ft, and unpressurised at 7,000ft. We observed that there was not enough room in two of the bulkhead segments for the crew at one time, and access to water food and storage in flight would have been impossible. 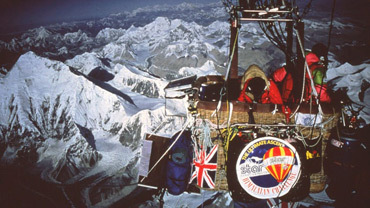 Due to our experiences of living in confined spaces while himalayan mountaineering, and climbing the big granite multi day climbs on the big walls in America and Yukon we provided a living and working routine that countered the human factor constraints and made the capsule liveable and humanly endurable. 2007 saw us back in the Everest region with a commission to undertake all the in country arrangements for GKN’s Mission Everest. We managed the government permits, advised the pilots on weather, terrain, and gave environmental risk assessments. We were not involved in equipment selection, engine build or cold climate testing this was undertaken by our colleagues at Parajet UK. GKN Mission Everest was followed in 2008 by the highly successful ground breaking adventure of himalayan skydiving from 29,500ft. This involved evaluation every aspect of conventional skydiving from scratch and how equipment would perform in such thin air. It meant building a special oxygen system for high altitude parachuting and landing, including designing and testing an ergonomic face mask system. We were delighted to break new boundaries in sport aviation and acquire several world records in the process, making 72 sorties and 34 descents from 29,500ft. 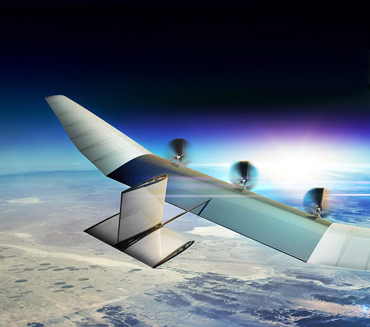 In 2010 Ozoneering gathered together a team of specialists to build an unmanned high altitude solar powered long endurance aircraft as we could see the rapidly emerging civilian use for such remote piloted platforms. It was Ozoneering who put the team together for the technical development, route to market and sale of the Ascenta™ solar powered HALE platform to Facebook in 2014 for their global connectivity programme. See these two videos: here and here for more details. Amongst other commitments in the last 18 months, Ozoneering has been involved in the development of intelligent payloads for multicopters for visual communication in disaster areas as well as other applications of such technology including aspects of dronevertising.